We've learned some of the secrets of Henry Lyme; now get ready to meet the rest of Mind Management! With the remains of the Management attempting to reform and hot on Lyme's tail, the former spy is forced to seek help from other defectors around the globe, including the deadly Futurist, Duncan! Meanwhile, losing her memory has barely slowed journalist Meru down, as an attempt on her life puts her back on the hunt for Mind Management—and on a collision course with the terrible truths Lyme has hidden from her! Collecting MIND MGMT #7–#12, plus stories from Dark Horse Presents and i09! * Foreword by Scott Snyder (Batman, American Vampire)! 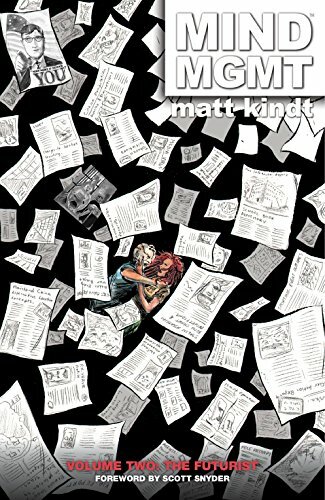 * Matt Kindt's (JLA, 3 Story) game-changing series ups the stakes! If you have any questions about this product by Dark Horse Originals, contact us by completing and submitting the form below. If you are looking for a specif part number, please include it with your message.